Day 47 – We were just sitting around so decided to go to Bedford to eat out. The restaurant we go to is pretty much in the city centre, so we walked to the centre and had a look around the shops. There were some rides as it is half term so the girls went on them. 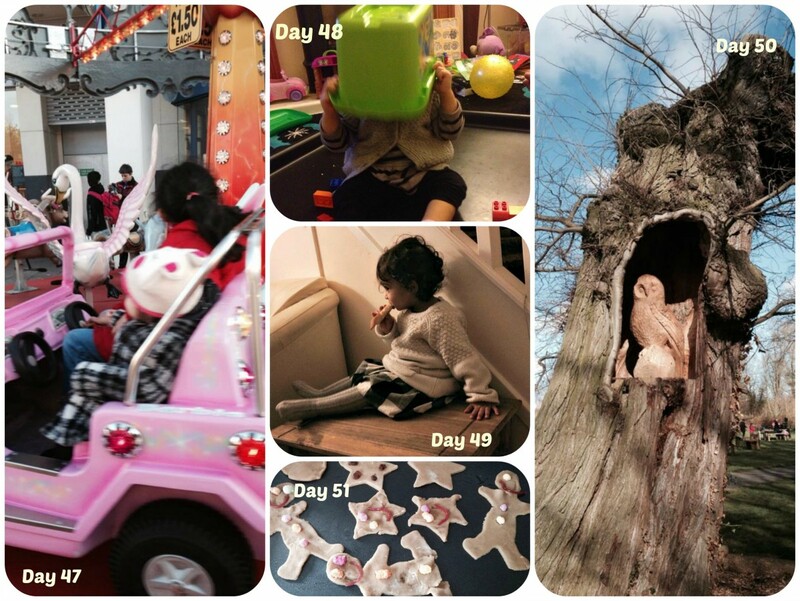 Day 48 – Spent most of it at home. I think Bee thinks she can’t be seen when she puts the Lego box on her head. Day 49 – Bee up to mischief again. I have given up trying to keep her in her highchair as she manages to escape from it and I refuse to buy another one because I probably won’t use it for long. I usually manage to get her to sit on the floor but today she decided she wanted to sit on the table to eat (rather than AT the table). Really didn’t have the energy to keep removing her so just left her to it. In all honesty am glad she is back to eating as she has been off her food. I have since realised she had 4 teeth coming out at the same time. Day 50 – Went on a little adventure to our local country park where they had a picture word trail. I just had to share this owl carved a tree stump that we came across. Day 51 – Went to our toddler group and made some gingerbread men. Munchkin got to go too and now she is waiting for the next holidays so that she can go again! Day 52 – Went to toddler group in the morning where they were showing alot of animals such as chinchillas, rabbits, snakes, lizards and also a tarantula. Munchkin had a chinchilla on her head and even held the snake. We then went to the local shopping centre as had heard there was going to be a dinosaur there. As they dragged it along on a cart I thought this was pretty boring and looked away at something else. Then my friend shouted at me to look and I noticed the dinosaur come off the cart and stand there and walk to the centre of the dedicated area roaring and acting all nervous due to all the people. It was totally amazing! Day 53 – Have been noticing Bee getting independent when it comes to food and wants to eat herself. So I generally leave her to it now to make a mess. 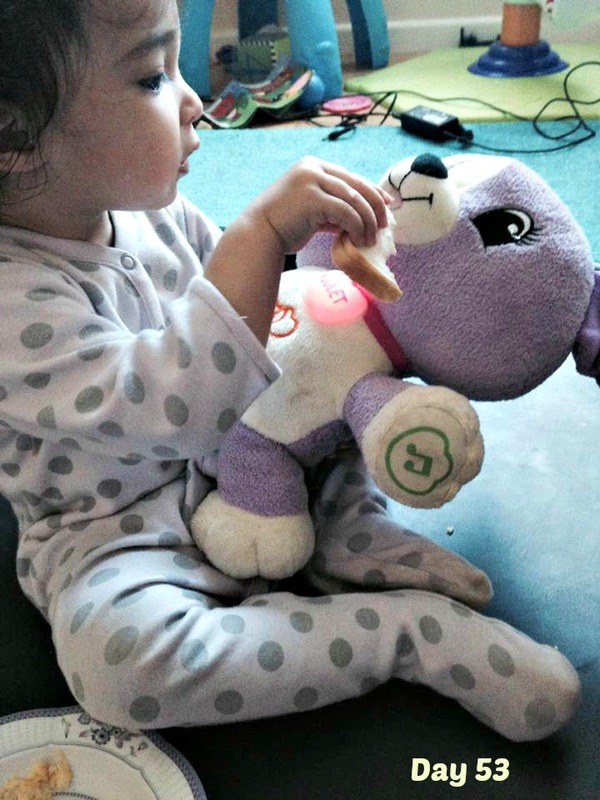 Here she is trying to feed her teddy rather than herself! My baby is growing up! Lego boxes always end up on heads at that age! 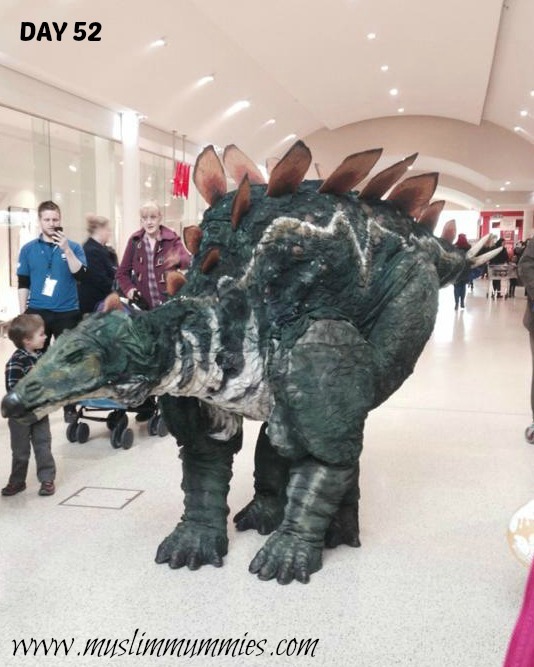 The dinosaur looks quite realistic – hope they weren’t too scared! I also have a child that refuses to use her highchair/booster seat and also to sit AT the table…. much rather sit on the table! Gosh you have been busy this week … I love the dinosaur! The dinosaur looks and sounds fantastic! that dinosaur looks quite scary for small children. Bee is so beautiful in that last picture, and so cute feeding her bear. That owl is really nice. Life With ASD and Me recently posted…My Baby Turned 3!